Unimpressive, but at least it's hard to get lost. Salisbury was laid out with a grid, its core mostly surveyed by T.A. Ross, who personally supervised the demarcation of about 2,500 lots. By 1897, even though the railway was two years away, the town had been declared a municipality. The European population grew steadily for 80 years: 1,725 people in 1904, 5,700 in 1921, 10,000 in 1931, 20,000 in 1941, 46,000 in 1951, 94,000 in 1961, and 112,000 in 1980. Since then, the European population has collapsed to about 12,000. As for Africans, they were not even counted until 1962. They then numbered 216,000, compared to about 1.6 million today. 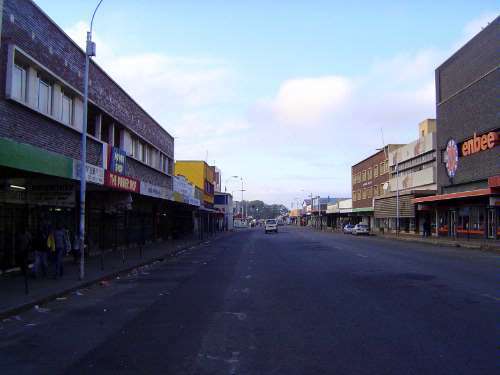 The two groups were historically segregated, with blacks crowded south of the tracks and toward the west, particularly in the townships of Highfield and Harari. Oddly enough, the white areas, north of the tracks and toward the east, were a third or more black, because almost every house had one or more black servants living in tiny, backyard shacks.